10 –Lee Burridge & Andy Page Why Are All The Pretty Ones Insane? 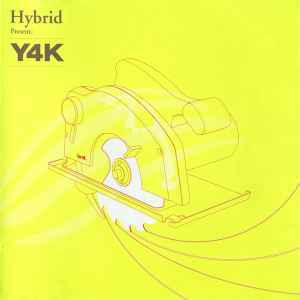 Title appears as 'Hyprid Present Y4K' on the release. 1 Recorded in The Blue Room at Wavecrest Studios, LA. Published by Anger Music/EMI Music. 2 Copyright Control ℗ & © Marine Parade 2004. 3 Copyright Control ℗ & © Lot49 2004. 5 Published by Rugged Vinyl Music/Westbury Music. & © VA Recordings 2004. Licensed courtesy of VA Recordings. 6 Published by ATV Music Publishing (UK) Ltd, Warner Chappell Music Ltd, Sony Music Publishing, EMI Music Publishing Ltd. ℗ 1996 The copyright in this recording is owned by Virgin Records Ltd. Licensed courtesy of Virgin Records Ltd. ISRC GB-AAA-96-00460. 7 Strings recorded at Melodia Studios, St Petersburg. Mixed at Electrotek Studios, Swansea. Published by Anger Music/EMI Music. 8 Published by Universal Music Publishing. ℗ & © Underwater Records 2002 Underwater Records. 9 ℗ & © Copyright Control 2004. 10 ℗ & © 2004 Back In 5 Minutes. 11 Published by Universal Music Publishing Ltd, M62/BMG Music. ℗ 1995 The copyright in this recording is owned by Virgin Records Ltd. Licensed courtesy of Virgin Records Ltd. ISRC GB-AAA-95-00062. 12 Published by Sony Music Publishing. ℗ 2004 Orbital Music Ltd.
13 Recorded at Melodia Studios, St Petersburg. Mixed at Electrotek Studios, Swansea. Copyright Control. Kirsty Hawkshaw is published by Nettwerk Publishing. Published by Anger Music/EMI Music. This compilation ℗ & © 2004 Distinct'ive Breaks. This album is dedicated to Alfie Healings.